The Henry Clay Stalk Cut is a new regular production line by Altadis USA. 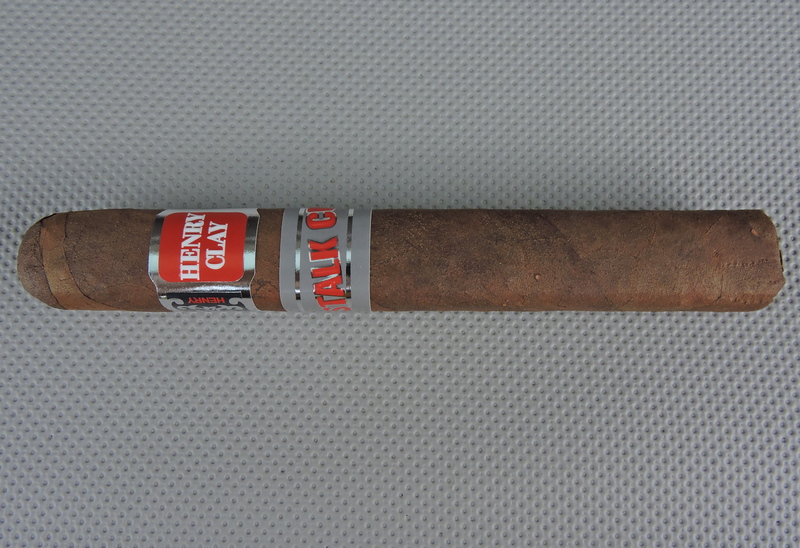 Henry Clay is a brand that traces its origins back to Cuba in the 1840s. Eventually it was a brand acquired by Altadis USA, who would acquire the U.S. rights to the brand. While Altadis released a Henry Clay cigar in the 1990s, this has pretty much been a dormant brand since then. All of that changed last year, when Altadis and Tatuaje’s Pete Johnson announced a limited edition collaboration called the Henry Clay Tattoo. The basis for that combination is that Johnson had enjoyed smoking those 1990 Henry Clay cigars and the Henry Clay Tattoo project served as a launchpad to bring a more up to date version to the market. 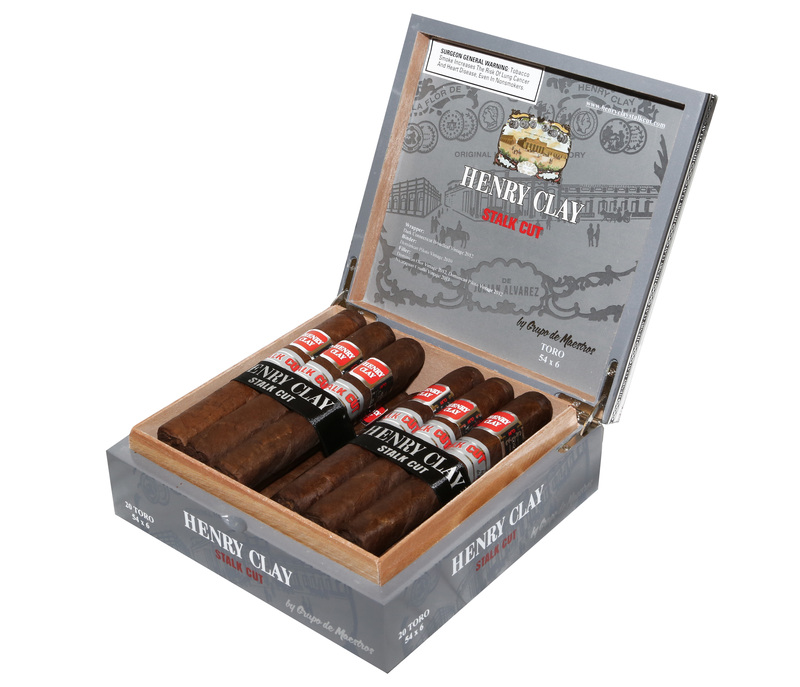 The release of the Henry Clay Tattoo not only breathed new life into the brand, but it would serve as a springboard to bring another blend to market – the Henry Clay Stalk-Cut. Recently I’ve had an opportunity to smoke the Henry Clay Stalk Cut in the Toro size. Overall I found this to be a satisfying smoke and one quite different from the original Henry Clay and Henry Clay Tattoo. The name Stalk Cut refers to the technique of harvesting tobacco. In this case, the entire stalk, containing all of the tobacco leaves is cut (as opposed to priming the leaves individually from the stalk). The stalk is then air cured in a curing barn. This method of harvesting has been used before, most prominently on the Liga Privada T52. For the Henry Clay Tattoo, Johnson collaborated with Altadis’ famed Grupo de Maestros team to produce that blend. The Grupo de Maestros team represents some of Altadis’ most skilled cigar makers and have been involved on many of Altadis’ high profile releases. With the Henry Clay Stalk Cut, this is a project where Johnson was not involved with. 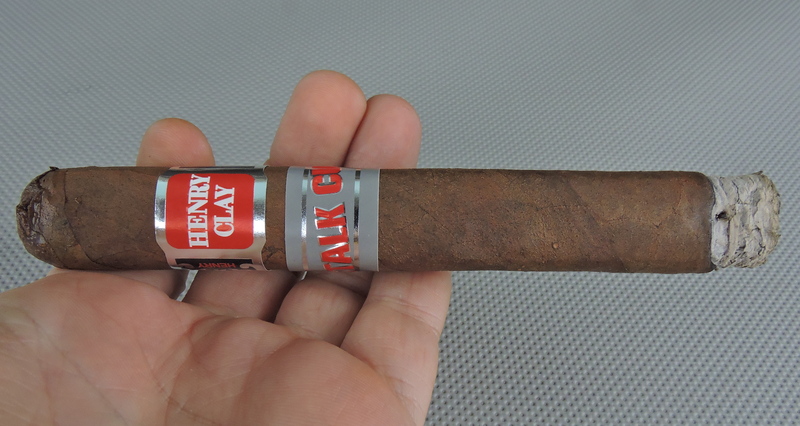 One other difference is the Henry Clay Stalk Cut is a regular production release – as opposed to the Henry Clay Tattoo which was a limited release. Without further ado, let’s take a closer look at the Henry Clay Stalk Cut Toro and see what this cigar brings to the table. Lately Altadis USA has been including the tobacco vintage years when disclosing blend components. The cigar is highlighted by a 2012 vintage Connecticut Broadleaf wrapper. The stalk cut technique is something that is common for the Connecticut Broadleaf crop. The cigar is made at Altadis’ Tabacalera de Garcia factory in the Dominican Republic. The Henry Clay Stalk Cut is available in three sizes. Each cigar features an uncut footer. The cigars are packaged in 20 count boxes with the cigars divided into two ten count bundles. Each size is a box-press in the similar square “breva” press style used on the original Altadis Henry Clay and the Henry ClayTattoo. While the Henry Clay Stalk Cut is also a Connecticut Broadleaf wrapper, I found this one to be lighter than what was seen on the Henry Clay Tattoo. Because the Stalk Cut comes from a different vintage than the Tattoo, I’ll infer that is one reason why it is lighter (there could be other factors). The wrapper is more of a medium / medium-dark brown wrapper. On the surface of the wrapper is a light coating of oil. There are some visible veins, but the cigar itself is void of any significant visible veins. The box press is firm with no soft spots. Finally, the cigar features a covered footer. There are two bands on the Henry Clay Stalk Cut. The primary band is a variation of the Henry Clay Tattoo. The front of the band features a red square-shaped background trimmed in silver. The text “HENRY CLAY” sits on that background in white font. The left and right side of the band is black and features silver trim and silver adornments. On the left side of the band close to the front is the red font text “CLAY” in landscape mode. The right side has text “HENRY” – also in red font and landscape mode close the front. The secondary band sits just below the primary band. This is a gray band featuring a silver pinstripe on both the upper portion of the band and the lower portion. The text “STALK CUT” in a large modern styled red font with silver trim trim goes across the band on a slight angle. The left side of the band features the text “HENRY CLAY” in thin black font. The right side of the band features the text “GRUPO DE MAESTROS” – also in thin black font. Prior to lighting up the Henry Clay Stalk Cut Toro, I went with my usual choice of a straight cut to remove the cap. Once the cap was removed, i moved on to the pre-light draw. The dry draw delivered notes of natural tobacco that had both a touch of nougat and a touch of cocoa. I also detected a slight tingly pepper spice. Overall I considered this to be a satisfactory pre-light draw. At this point I was ready to light up the Henry Clay Stalk Cut Toro and await what the smoking phase would have in store. Out of the gate, the Henry Clay Stalk Cut Toro started out with more notes of natural tobacco, cocoa, and red pepper. The natural tobacco and cocoa combination became primary early on. On the tongue, the red pepper became a secondary note, however I found it to be more prominent on the retro-hale. As the Henry Clay Stalk Cut Toro burned through the first third, some nut flavors emerged and they quickly took over as a primary note. The natural tobacco and cocoa notes started to float in and out of the forefront. As the cigar burned through the second third, the cocoa less frequently surfaced in the forefront. During the second third, the nut flavors remained the primary note. I also noticed an increase in the red pepper notes. By the last third, the red pepper took over as a primary note. The nut flavors diminished into the background joining the natural tobacco and cocoa. Toward the end, I found this cigar had somewhat of a spicy profile. As the cigar came to a close, it finished up with a nub that was cool in temperature and firm to the touch. Overall, I found the Henry Clay Stalk Cut Toro to maintain a straight burn path and have a relatively straight burn line. The only issue was the closed footer was somewhat loosely affixed to the cigar, which I found to be very flaky when lit. Once it flaked off the cigar, the ash became firm. I found the ash itself to have a silvery gray color. Meanwhile the burn rate and burn temperature were ideal. As for the draw, I found the Henry Clay Stalk Cut Toro to not be too tight, nor too loose. This made this cigar a low maintenance cigar to derive flavors from. From a strength perspective, I found the Henry Clay Stalk Cut Toro to be medium in strength. This pretty much put it in the same wheelhouse as the Henry Clay Tattoo. As for the body, I did find the Stalk Cut Toro had a little more depth than the Tattoo. The Stalk Cut Toro starts out medium-bodied, but quickly goes to medium to full -bodied territory for the majority of the smoke. In terms of strength versus body for the Henry Clay Stalk Cut Toro, I found the body had a slight edge throughout the cigar experience. While there are some parallels between the Henry Clay Tattoo and the Henry Clay Stalk Cut, I found these two be very different cigars despite having similar tobacco profiles. It’s hard to determine what’ exactly different. While much Connecticut Broadleaf is stalk cut when cured, it was never documented if the Henry Clay Tattoo employed this technique for its wrapper. There could be priming and aging considerations at play for the difference as well. Finally, like the Tattoo, I do think the Stalk Cut has some aging potential. When I assessed the Tattoo, it had more age than this cigar. This is a cigar I would recommend to an experienced cigar enthusiast or a novice cigar enthusiast looking to graduate to something medium / medium plus. As for myself, this is a cigar I would smoke again – and it’s worthy of a fiver. I smoked my first stalk cut cigar last week. The Henry Clay was a disappointig smoke to me. Wouldn’t stay lit and the taste was not very good. Maybe I should age one and hope for a better experience.